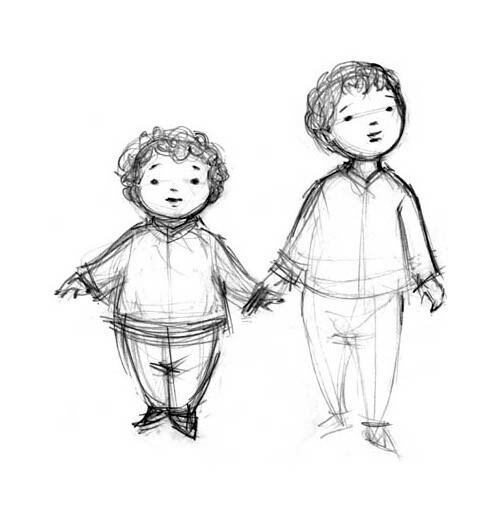 I’ve got some spreads and early sketches/images this morning from Caldecott Honor winner Margaret Chodos-Irvine (pictured left is one early sketch), whose printmaking work has graced many a picture book. I’m always eager to see her new illustrated titles. This one, Dinosaur Thunder (Scholastic), written by Newbery Honor author Marion Dane Bauer, will be out in May, but I saw an early copy and fell for it. Dinosaur Thunder is the story of Brannon and his imaginative reactions to thunder. 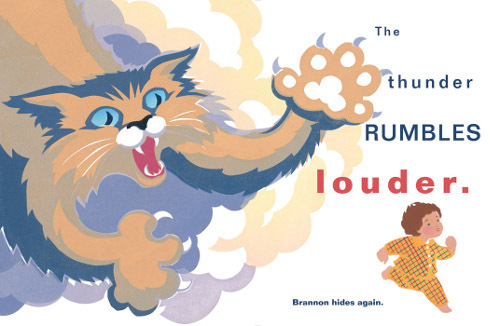 “When lightning flares in the faraway sky and clouds growl like lions waking…” Well, this young boy’s big brother Chad does a happy jig in the middle of the room—thunder just does that to some people—but Brannon is scared and looks for a place to hide. He gets various responses from the adults in the house about what thunder really is, and as adults are wont to do sometimes, they confuse him. “Don’t be scared … That thunder is only a big cat purring,” says his father. But, you see, the neighbor’s cat once tried to scratch Brannon, and his imagination runs wild. 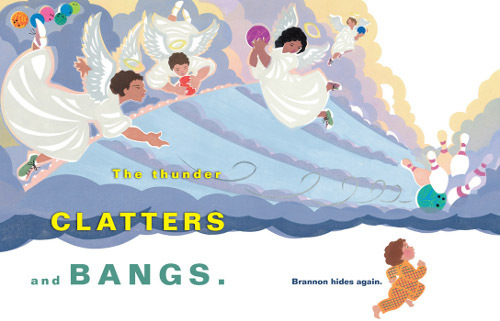 Or could the thunder be angels bowling in heaven? Or clouds bumping together? (“What if a cloud bumped into him? 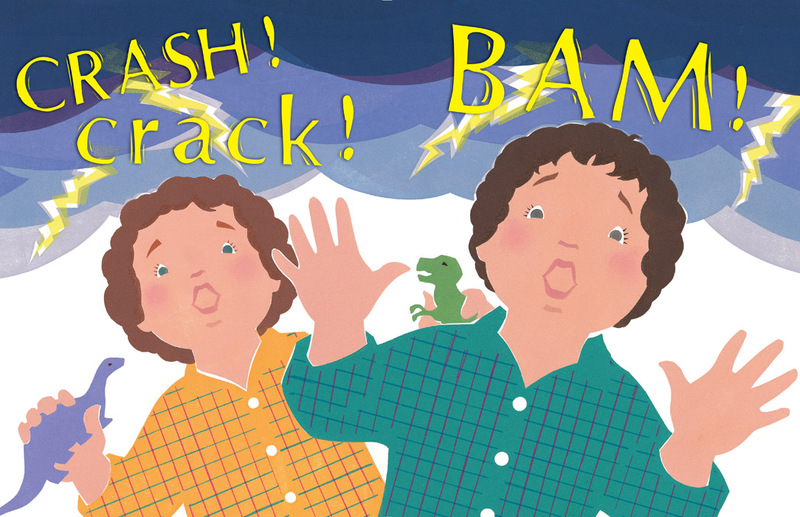 Would he make a noise like thunder, too?”) Or, says Chad, thunder is just dinosaurs stomping around. 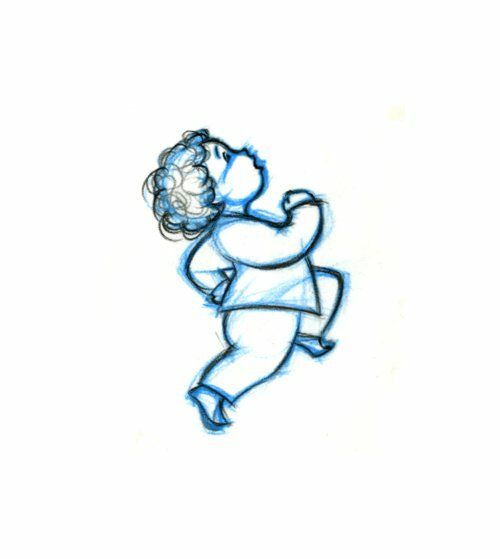 Margaret’s here to share a few process shots. Leave it to mama in the end to tell the boys the truth (and fold them into her arms): It’s only thunder. And all’s well that ends well, but I won’t give away the entire story here. It’s a well-crafted book all-around. 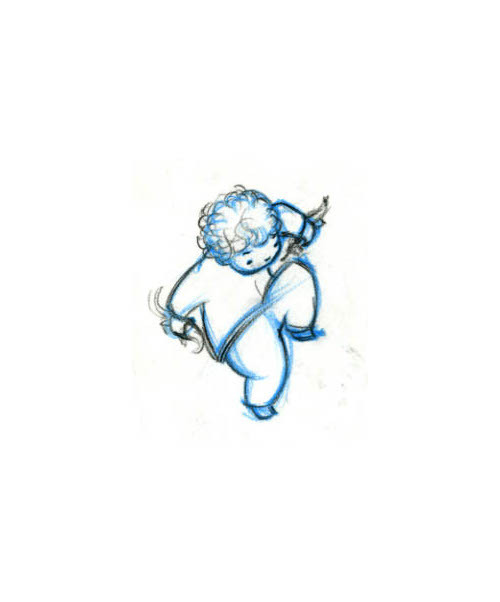 Here are some early sketches and character studies from Margaret, and I thank her for sharing. 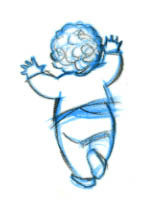 Illustrations copyright © 2012 by Margaret Chodos-Irvine from DINOSAUR THUNDER by Marion Dane Bauer. OH! 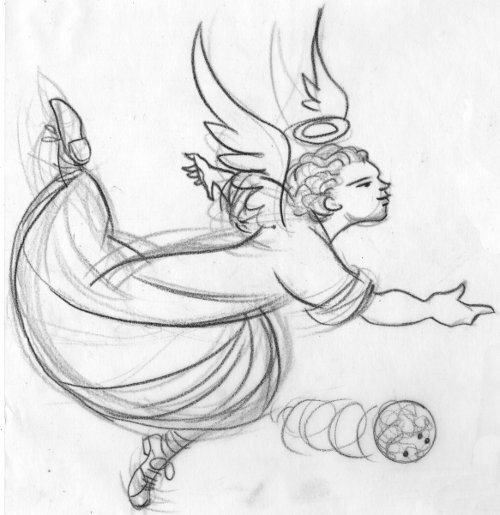 I LOVE that print of angels bowling! What an adorable book. LOVE that artwork. 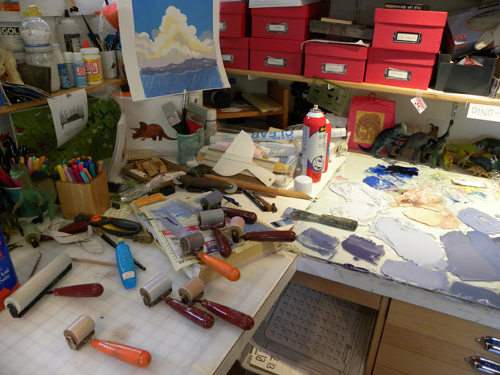 I have ALWAYS wondered about her printmaking process, thanks for the peek Margaret and Jules! 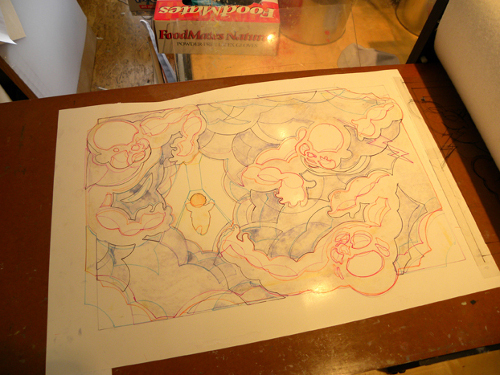 I like seeing how the line drawings are transformed in the prints – they lose a lot of the detail but keep the energy. The images get concentrated and the simplicity makes them stronger. I love Chodos-Irvine’s art. Ella Sarah Gets Dressed and Best, Best Friends are, in particular, two of my very favorite storytime books. This one looks like it will be great, too. Love her work. 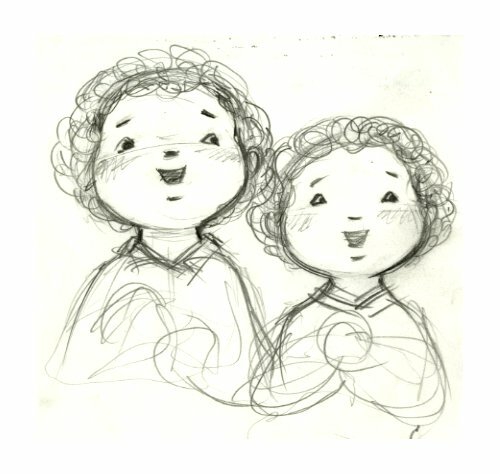 Thanks for sharing these sketches and a glimpse of Margaret’s studio. What a treat!